Your day-by-day itinerary now includes Copacabana Beach, Vista Chinesa, Museum of Tomorrow, and other attractions you added. Your cultural itinerary includes sights like Imperial Museum and Jardim Botânico do Rio de Janeiro. There's still lots to do: take in the awesome beauty at Sugarloaf Mountain, view the masterpieces at Centro Cultural Municipal Parque das Ruinas, don't miss a visit to Escadaria Selaron, and contemplate the long history of Parque Lage. 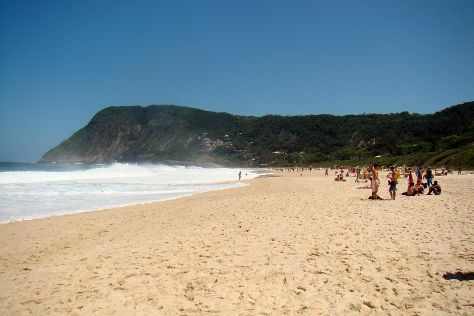 For where to stay, traveler tips, maps, and more tourist information, use the Rio de Janeiro online trip maker . The Route module shows you travel options from your home to Rio de Janeiro. In July, plan for daily highs up to 30°C, and evening lows to 22°C. Finish your sightseeing early on the 4th (Sun) to allow enough time to drive to Niteroi. Sitting across Guanabara Bay from the metropolis of Rio de Janeiro, the municipality of Niteroi makes up part of the Rio de Janeiro metropolitan area. MAC Niteroi - Museum of Contemporary Art has been added to your itinerary. Kick off your visit on the 6th (Tue): take in the history at Sao Luis Fortress, then walk around Serra da Tiririca State Park, and then admire the masterpieces at MAC Niteroi - Museum of Contemporary Art. On the 7th (Wed), you'll have a packed day of sightseeing: tour the pleasant surroundings at Camboinhas Beach, kick back and relax at Praia de Itacoatiara, and then pause for some serene contemplation at Basilica of Nossa Senhora Auxiliadora. To see other places to visit, traveler tips, reviews, and tourist information, you can read our Niteroi journey builder tool . Niteroi is very close to Rio de Janeiro. In August, plan for daily highs up to 30°C, and evening lows to 22°C. Wrap up your sightseeing by early afternoon on the 8th (Thu) to allow enough time to drive back home.